About 40 percent of Americans—and a majority of Hispanics—feel better off financially under President Donald Trump compared to under former President Barack Obama. 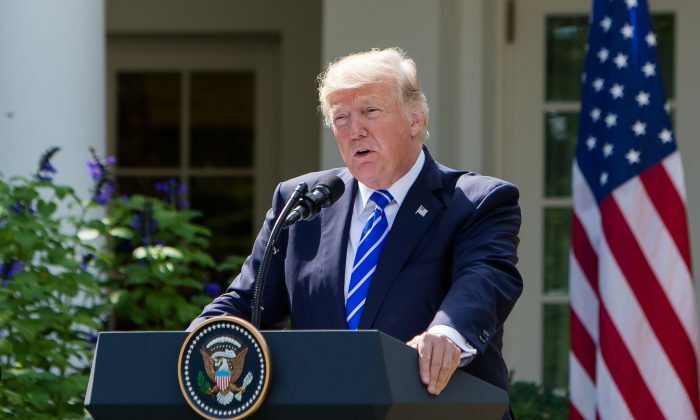 Data from the latest national survey conducted by Emerson College revealed that 42 percent of Americans felt better off financially, while 26 percent said they were worse off under Trump. About 30 percent said their finances were similar to 2016. The July 9 poll also revealed that among Hispanic voters, a “distinct majority” of 62 percent believed that they were better off, while 25 percent thought they were worse off. Hispanics have historically leaned Democrat, and the latest polls could be a cause for alarm for the party as midterm elections approach in November. The mid-year Emerson poll, conducted online, also tracked Trump’s job approval rating. Emerson noted that the president continued to maintain his support among the 35 to 54 age group, which gave him a 51 percent approval rating, compared to 42 percent who disapproved. “The financial situation of voters could be a major reason for the improvement in Trump’s approval rating,” Emerson wrote in the findings. Trump also seemed to agree with the survey, tweeting about the results of the poll on July 10. A recent Emerson College ePoll said that most Americans, especially Hispanics, feel that they are better off under President Trump than they were under President Obama. Party preference seems to play a role in terms of which economic system Americans prefer. For those who voted for Hillary Clinton in 2016, 37 percent support a socialist economic system while 34 percent do not. In contrast, among Trump voters, 76 percent support a capitalist system while only 9 percent do not. Another recent poll from Zogby Analytics reveals a similar trend of Hispanics feeling optimistic about the economy under Trump, with 43 percent of Hispanics saying the next four years will be excellent (12 percent) or good (31 percent) for the economy. The Bureau of Labor Statistics jobs report released on July 6 shows Hispanic unemployment at the lowest level ever recorded, dropping to 4.6 percent in June, while a net of 164,000 Hispanics entered the labor force. The Media Research Center (MRC) found that national Spanish television networks in the United States, including Telemundo (an NBC sister network), Univision, Azteca America, and Estrella TV, ignored the news.